These are some of the best roasted potatoes you will ever lay on your dinner plate! With the fresh herbs from the garden, pearl onions, whole crushed garlic cloves, and finished with grape or cherry tomatoes, these roasted new potatoes will be a welcome side dish to any meal. Procedure Steps: Preheat oven to 400º F.
1. Clean the potatoes and cut into bit sized pieces about 1-inch in size and place into a large bowl. 2. Smash the garlic cloves with the side of a chef knife to release some flavor, then toss them with the potatoes. Then add the pearl onions, olive oil and fresh chopped herbs. Toss well and season with salt and pepper to taste. 3. Transfer the ingredients to a 9X13-inch roasting pan, and roast in the oven for 20 minutes, remove from oven and stir, then return to oven for another 20 minutes, remove and stir again. Test a few potatoes with the tines of a fork, when the potatoes are tender, then add the tomatoes and stir well. Return to the oven and roast another 5 minutes. Herb Roasted Potatoes served with Oven Fried Catfish and braised cucumbers. These are really simple yet full of flavor! I love roasting potatoes, carrot, tomatoes and garlic, especially during these cold fall nights! You are so right; these potatoes and any root vegetables are great on a cold night! 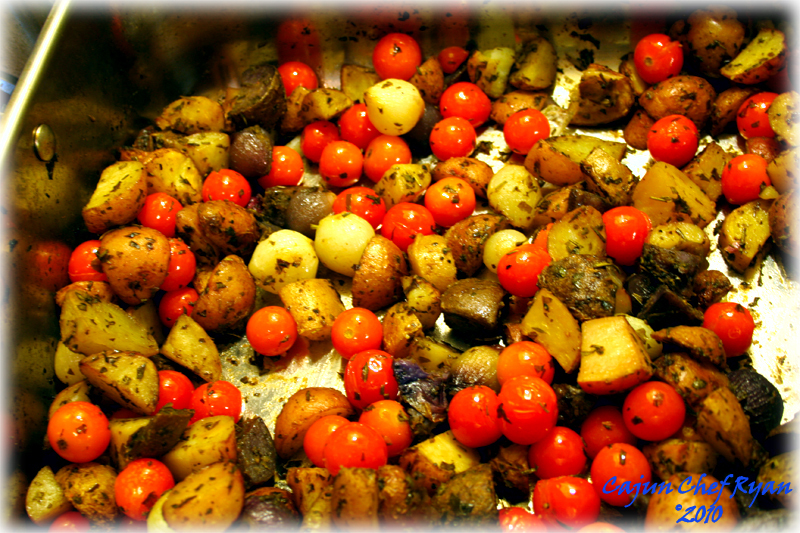 I love herb roasted potatoes and usually serve my tomatoes separte. Thanks for this recipe that puts them both together! 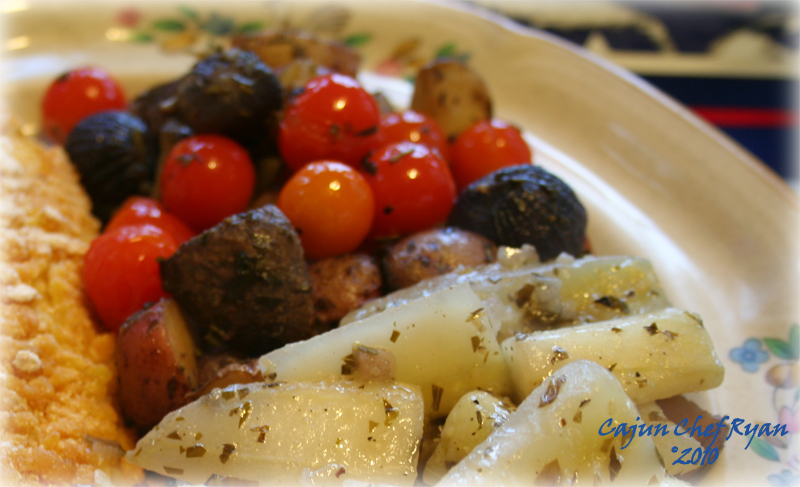 great flavors and color, I never thought about using grape tomatoes with roasted potatoes great idea! So glad to hear from you, you must be feeling better now! They are amazing together, just great with stir fried vegetables, just put the tiny tomatoes in toward the end of cooking. That looks sooo good. I’m low on tomatoes this year, but have a bunch of smaller eggplant to use up. Do you think this would be good with sliced eggplant instead, if I gave the slices a quick oven roasting while getting other ingredients ready? Or would I even need to oven roast, if the slices were thin enough? Our summer crop of tomatoes and eggplant is still producing, but they are on the wane for sure. If you use the eggplant in place of the tomatoes, what I would do is cut them into 1-inch cubes and then add them to the oven with the potatoes, and allow them to roast along side. If you cut the eggplant into smaller slices then you can add them at the last 20 or 30 minutes of cooking time. I have those ingredients… I must make that! Thanks for posting! What a perfectly seasoned meal!! I make a mean mix of these little puppies too Ryan.., it makes just about any dish better. Looks so comforting! I could use a bowl of that. I LOVE using both herbs and tomatoes, so these look fabulous- and I’ll bet the leftovers would make a gorgeous frittata! The colors are so gorgeous in that dish. I can just imagine how wonderful it tasted. This sounds like my perfect meal. I’ve made similar things before and this sounds delicious. I love the mixing of the cherry tomatoes with the roasted potatoes, the combination sounds terrific and looks so pretty! I’ve made rosemary roasted potatoes for years and never thought to add in the tomatoes. Great idea. Thanks. You’ve got some of my favourite roast veg in here! Wonderful side dish, especially with those garlic cloves. I love roasted potatoes, your recipe is just perfect. Never thought about adding tomatoes, a favorite ingredient of my. Thanks for sharing your mouthwatering recipe. Hey folks, thank you all so much for commenting on the herb roasted potatoes, these have become a favorite at our house.